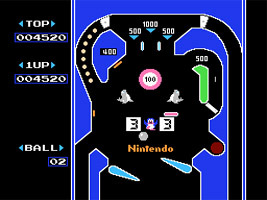 A simple pinball game featuring a single table split into two screens, plus a third Bonus screen. You control the paddles at the bottom of each screen. Keep the ball in play in order to rack up high scores by hitting bumpers and other table features. Game B is a faster version of Game A. There is also a 2-Player mode, where each player takes it in turns to compete for the high score. On the bottom screen, hit the ball into the hole on the right-hand side of the table. 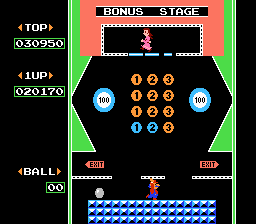 You will be taken to a bonus stage starring Mario and Pauline from Donkey Kong. You control Mario carrying a platform, and you have to free Pauline by bouncing the ball to remove the platforms under the wandering Pauline. You then have to catch her and move her to the exit safely for a bonus score. Mario also appears on the game's U.S. boxart holding the platform.